Safety awareness and prevention of accidents is an ongoing issue in rural areas and of concern to the community as a whole. The Rotary Club of Rochester has held Farm and Road Safety Expos for the past 19 years to spread the safety message. Their aim is to make aware and educate school children and adults on all issues pertaining to road and farm safety. Last year 500+ children, teachers and members of the public attended the Expo (numbers were well down due to the inclement weather). Feedback indicated they thoroughly enjoyed the day while at the same time experiencing the invaluable message of safety on the farm and road. The committee is holding the Farm and Road Safety Expo on Tuesday 21st August 2018. 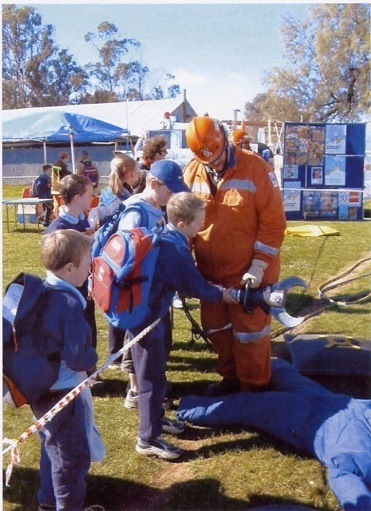 This will include interactive and static activities and displays in all aspects of safety involving emergency services and organisations. Schools in the Campaspe, Greater Bendigo, Greater Shepparton and Murray Shires have been invited to attend this year's Expo. The Expo is also open to the general public. The Expo is a non-profit-making event with free entry and a free barbeque lunch available to all who attend. The Farm and Road Safety Expo (FARSE) committee invite you and members of your Club to attend this year's FARSE. to witness and take part in this important event on the Rotary Club of Rochester's calendar. The Expo is to be held at the Rochester Recreation Reserve (Football/Show Ground), Reserve Street, from 10.00 am to 2.30 pm.